Painted Skin Resurrection 3D Blu-ray Review The protagonists are so generic that the film’s romantic climax induces arrant indifference. Wuershan’s Painted Skin: The Resurrection is a tour de farce that operates on an exclusive emotive wavelength that might be accessible only to Chinese filmgoers and fans of the first installment. The film follows on from Painted Skin (2008) but it is not being billed as an official sequel. Excitement for the film is sky high as it set seven new records in China for a domestic film, including highest box office gross on an opening day. It relates the story of a fox demon, Xiaowei (Zhou Xun), who is encased under a frozen lake as a punishment for violating demon law. Her will to survive attracts Que’r (Mini Yang), a bird spirit, who subsequently rescues her. According to demon lore, a demon can become a mortal and attain human senses only if a pure heart is freely offered to it. This is why Xiaowei becomes a courtier to Princess Jing (Vicki Zhao), the only person who possesses the heart she needs to become mortal. Meanwhile, Princess Jing struggles with her own dilemma. 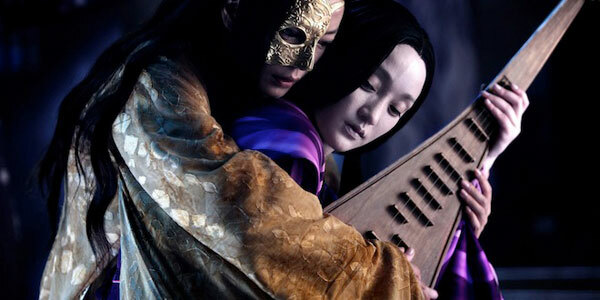 She is born to serve her kingdom but desires an impossible romance with her guard, Huo Xin (Chen Kun). Xiaowei devises an elaborate plan to persuade Princess Jing to swap bodies with her so that they can both fulfil their dreams, however, her plan is compromised when an army from the Kingdom of Tian Lang arrives. This body-swap plot is also entwined with a romantic subplot involving the cheeky Que’r and a clownish demon hunter (Feng Shaofeng). There is little to recommend in this dramedy. It is difficult to warm to largely due to its disorienting non-linearity, its unsuccessful situational comedy and the seizure-inducing extravagance that its imagery produces. What makes things even worse is that much of the film’s artificial enhancers are injected into a story that was already superficial and overwrought to begin with. The 3D effects are barely noticeable even if the ornate cinematography distracts the viewer from making this realisation. At the film’s low point, Princess Jing experiences a dramatic flashback to when she was about get killed by a surging graphic bear before Huo Xin later saves her life. All the film’s characters lack any real charm or depth thus resulting in equally uninteresting relationships. Princess Jing plays a once beautiful princess with a scarred face who falls for her strong, silent guard, even though he is beneath her station, but she wistfully wonders if he shuns her because she lost her beauty or because he’s in love with Xiaowei: a profound question indeed. The protagonists are so generic that the film’s romantic climax induces arrant indifference. Perhaps the film might have been slightly more watchable if Wuershan had done a reasonable job of assimilating franchise newbies such as myself into the fold but alas he is found wanting in this department as well. All of these foregoing defects make for a disastrous movie that falls far, far short of the great expectations that surround it.